When you think of your ultimate hummus experience what do you think of? I always think of a pita with creamy, lemony hummus, doused in garlic tahini sauce, brightened with fresh parsley and cucumber, and stuffed generously with either roasted potatoes or cauliflower (I always prefer the roasted vegetable filling to falafel). It’s probably no surprise that I just described this dish, except there is a lot more hummus going on here, which is a proportion I very much enjoy. Of course, because there isn’t as much bulk with the bread, I decided to also add a soft boiled egg on top to make it into a meal. It ended up being so filling and fun to eat. 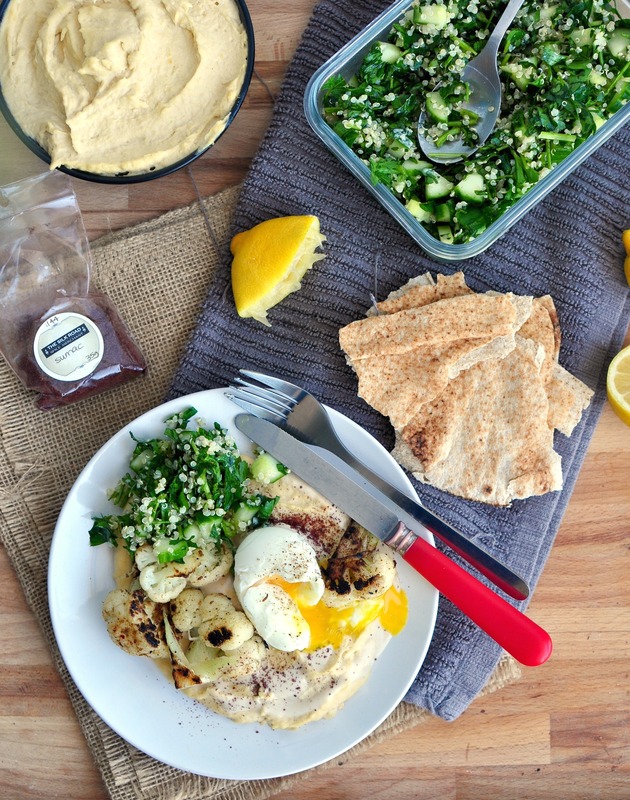 You could smash everything together into a piece of pita or eat the elements separately. It’s fresh, filling but light, and totally customizable if you have something else that you love in your pita. In retrospect, I think that some sliced pickles would be very, very enjoyable on this plate. 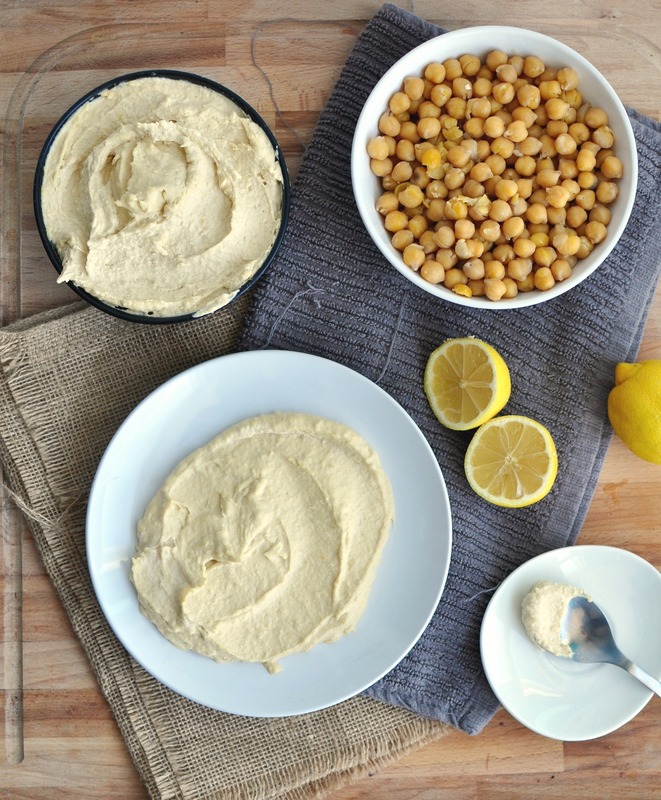 I make hummus every now and then but I have always used canned chickpeas. Obviously, it’s so much easier and more convenient to open a can. Dried chickpeas require time, foresight and planning (But very little work, to be fair). I had to decide that I was going to make this dish a whole 24 hours in advance! I realize some people do this all the time. In fact, I hear some people plan their meals for an entire week in advance, so if you’re one of those people, give the dried chickpeas a try. 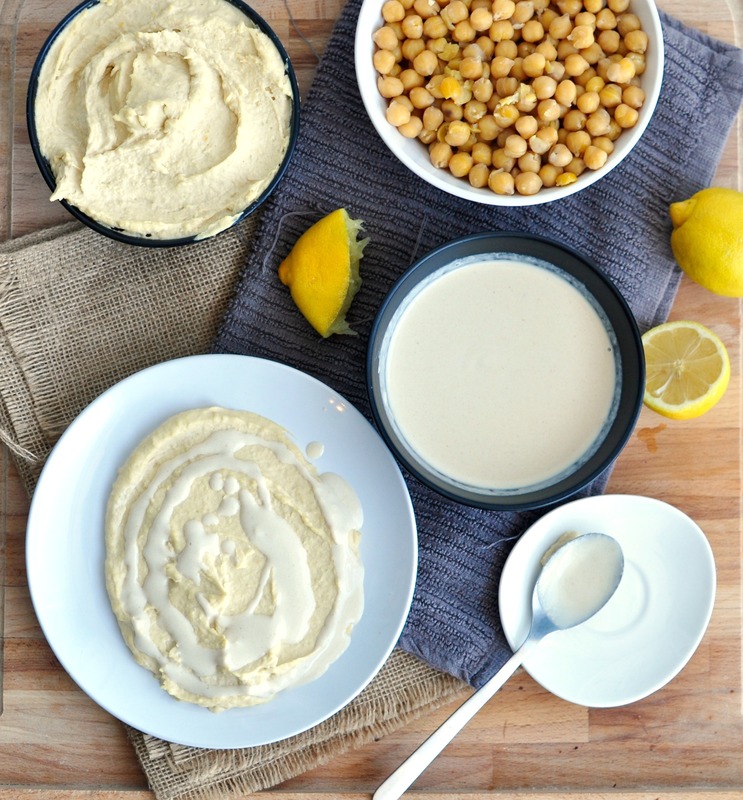 I must acknowledge that this was probably the creamiest hummus I have ever made but if you’re not interested in taking the extra step to soak your chickpeas or you want to make this right now, feel free to use canned chickpeas and garnish it with all of the toppings. It’s an amazing meal. This can easily be made vegan by leaving off the egg. Soak dried chickpeas in 6 cups of water, overnight. In a large pot bring soaked chickpeas in 12 cups of water and baking soda to a boil. During the first couple minutes of boiling, skim off the white foam that floats to the top of the pot. Simmer chickpeas for about 40 minutes, until completely soft. Let the chickpeas cool to room temperature and drain well, reserving 1/2 cup of cooking water. In a food processor, blend chickpeas until it's a smooth paste. Add tahini, lemon juice, garlic, and salt blending until smooth. If the hummus is too thick, add a bit of the chickpea cooking water. Taste and adjust with any extra lemon or salt. In a small bowl, whisk together all of the ingredients. Taste and adjust with any extra lemon or salt. Fill a medium pan up with 1/2 inch of water. Bring water to a boil and put cauliflower in pan. Cover pan and let cauliflower steam, until tender (about 5 minutes). 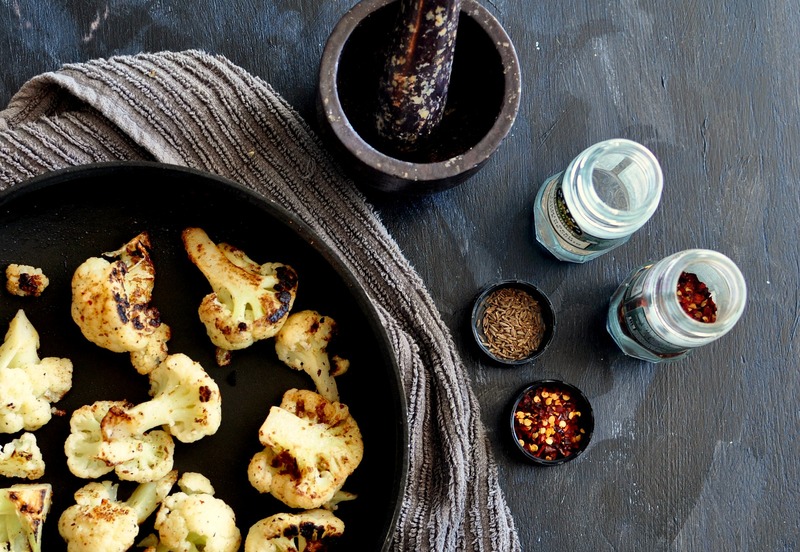 Drain the water out of the pan, keep over high heat, add a splash of oil, ground cumin and chilli flakes, salt and pepper and let the cauliflower florets blacken in the pan. Put 1/2 cup quinoa and 1 cup water in a small pot. Bring to a simmer and cook, covered for 20 minutes, until all the water is absorbed. Mix all ingredients together in a bowl. Taste and adjust lemon, salt and pepper to taste. Soft boil as many eggs as you need (1 per serving). Place egg in boiling water and cook for 6-7 minutes. Peel and season with salt and pepper. Smear hummus generously onto plate. 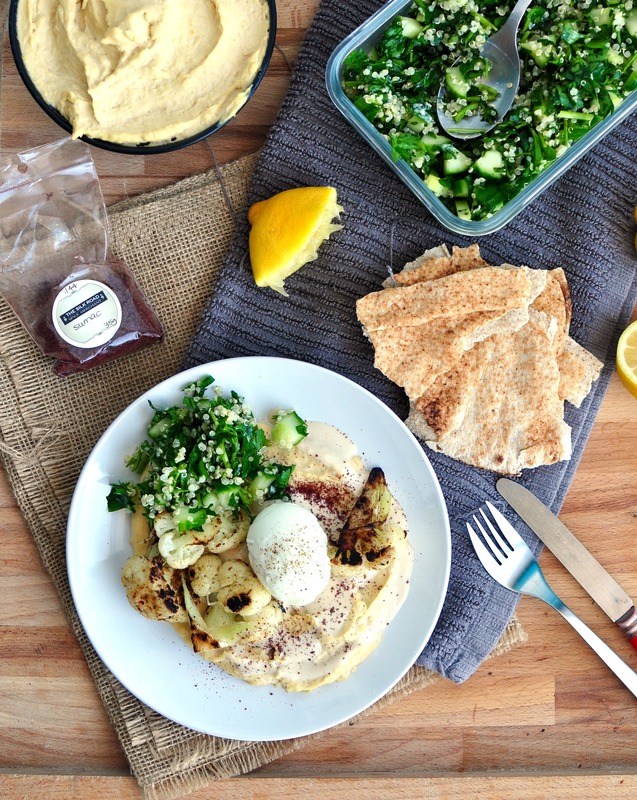 Drizzle tahini generously over hummus. 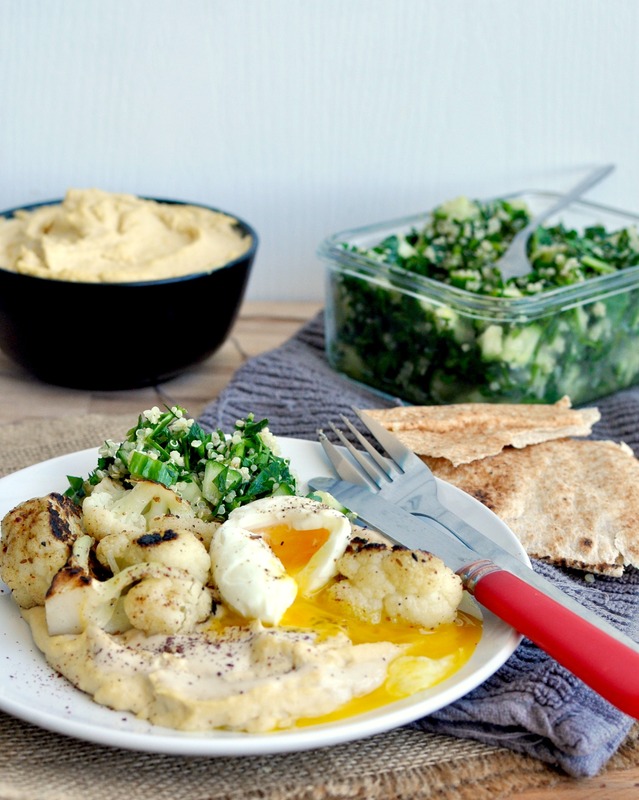 Top with cauliflower, parsley salad and egg. Sprinkle with sumac. Serve with warm pita.